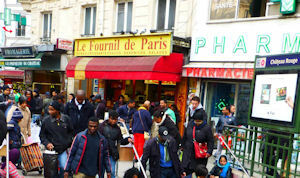 On a Saturday afternoon in mid-April, we took a guided walking tour of the neighborhood called Goutte d’Or that lies to the east of the Château Rouge metro station in the 18th arrondissement of Paris. The walk was organized by Baština, an association that promotes tourisme équitable, a type of tourism where small numbers of travelers meet the locals and interact with them. Read about our visit to this fascinating neighborhood in this month’s Paris Insights newsletter. 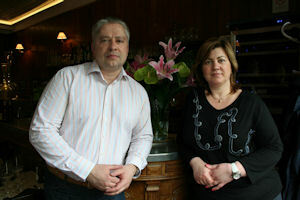 Oleg Kononov and Irina Kononova came to Paris from Moscow five years ago. Read about Les Trois Carafes, a restaurant that they opened near the Jardin des Plantes, and the delicious food that is served there in this month's Le Bon Goût. The city of Paris has prepared the groundwork for the construction of two buildings in the Goutte d'Or neighborhood that will comprise the new locations of the Institute of Islamic Cultures. Learn more in this month's Paris, Past and Present.